 15 With the tripped-out, drug-induced experimental cover of Cheers' theme song, Mates of State establish this album as a warped take on pop culture. Then they kick into some fuzzy, guitar-driven indie rock, changing the pace and tone of the album for the remainder of the disc. 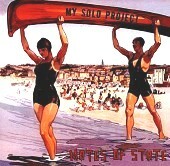  15 15Mates of State's My Solo Project is an energetic, slightly sugar coated pop record with boy and girl vocals melding together in perfect unison. This is the type of indie band that has the potential to cross over into other genres, delivering a true-to-the-scene indie rock cred record complete with vintage keyboard sounds spread throughout quirky-enough pop songs that indie kids will eat up.